AMTA.Pro » Blog Archive » Potential Harm in Music Therapy? Have you ever heard music therapy described as “non-invasive”, “non-threatening”, or as a treatment with no side effects? These incorrect assumptions that music is innocuous at worst are troublesome. If we ignore the possibility that music interventions can be harmful or that a client may become distressed during a session, then we cannot begin to remediate harm with it happens. Although the AMTA and CBMT Scope of Practice acknowledge the potential for harm within music therapy practice, definitions of harm or ways of conceptualizing harm are few and far between in music therapy literature. This podcast introduces the Music Therapy and Harm Model (MTHM), which aims to provide a way of conceptualizing sources of harm in a music therapy session. 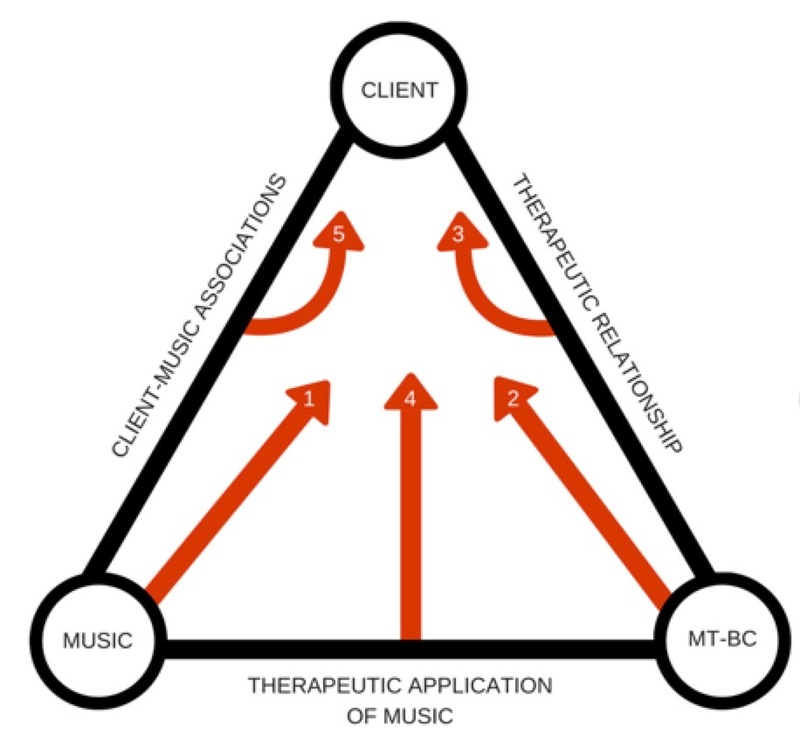 The MTHM visualizes three core components that are present in every music therapy session: the client, the music, and the music therapist. In addition, three interactions link these components: the therapeutic relationship (between the client and music therapist), the therapeutic application of music (between the music therapist and the music), and client-specific associations with the music (between the music and the client). Five of these elements are theorized to be sources of harm: 1) the music, 2) the board-certified music therapist, 3) the therapeutic relationship, 4) the therapeutic application of music, and/or 5) client-specific associations with the music. If harm occurs within the session, these same five elements should be responsive to the client’s needs and appropriately coordinated by the music therapist to reduce or lessen distress. In this way, we can also understand the unique protective factors within music therapy. This discussion also reviews the advocacy, educational, and research implications of the MTHM, as well as future directions for studying this important topic. As of the release of the October, 2018 release of this AMTA-Pro podcast, the manuscript for the Music Therapy and Harm Model (MTHM) has been submitted for publication. Acknowledging the potential for music interventions to cause physical and/or psychological harm has important professional implications for music therapists that extend to advocacy and educational training domains. Currently, definitions of harm and methods of conceptualizing harm pertaining to music therapy practice are very sparse and sporadic. The Music Therapy and Harm Model (MTHM) theorizes that harm can arise from five potential sources during the music therapy session: 1) the music, 2) the board-certified music therapist, 3) the therapeutic relationship, 4) the therapeutic application of music, and/or 5) client-specific associations with the music. The same five elements of the MTHM can become protective factors to mitigate harm if they are appropriately responsive to client distress during a music therapy session. Self-awareness and a willingness to seek out supervision for challenging clinical experiences is the first step for music therapists to acknowledge potential instances of harm in their own practice. Barlow, D. H. (2010). Negative effects from psychological treatment. American Psychologist, 65(1), 13-20. Dimidjian, S., & Hollon, S. D. (2010). How would we know if psychotherapy were harmful? American Psychologist, 65(1), 21-33. Gardstrom, S. C. (2008). Music as a noninvasive treatment: Who says? Nordic Journal of Music Therapy, 17(2), 142-154. Gattino, G. S. (2015). Some considerations about the negative effects of music. Musica Hodie, 15(2), 62-72. Hatfield, D., McCullough, L., Frantz, S. H. B., & Krieger, K. (2010). Do we know when our clients get worse? An investigation of therapists’ ability to detect negative client change. Clinical Psychology and Psychotherapy, 17, 25-32. Isenberg, C. (2012). Primum nil nocere (above all, do no harm): A direction for the development of music therapy. Canadian Journal of Music Therapy, 18(1), 62-78. Jonsson, U., Alaie, I., Parling, T., & Arnberg, F. K. (2014). Reporting of harms in randomized controlled trials of psychological interventions for mental and behavioral disorders: A review of current practice. Contemporary Clinical Trials, 38, 1-8. Ladwig, I., Rief, W., & Nestoriuc, Y. (2014). What are the risks and side effects of psychotherapy? Development of an inventory for the assessment of negative effects of psychotherapy (INEP). Verhaltenstherapie, 24, 252-264. Linden, M. (2013). How to define, find and classify side effects in psychotherapy: From unwanted events to adverse treatment reactions. Clinical Psychology and Psychotherapy, 20, 286-296. Rheker, J., Beisel, S., Kraling, S., & Rief, W. (2017). Rate and predictors of negative effects of psychotherapy in psychiatric and psychosomatic inpatients. Psychiatry Research, 254, 143-150. Roskam, K. S. (1993). Cluttering the psychological house: The damage music can do. In Feeling the sound: The influence of music on behavior (pp. 49-61). San Francisco, CA: San Francisco Press, Inc.